We've recently expanded our building in order to provide more comforts to you and your pet! To provide a safe, active and healthy recreational environment which meets canine & feline physical and training needs, while improving the quality of life of both pets and the owners who love them. Good Shepherd Veterinary Hospital Boarding and Daycare believes a safe and nurturing environment, coupled with active mental and physical stimulation, leads to a happy, healthy life for our pets. To meet the physical and recreational needs of your pet at Good Shepherd Veterinary Hospital Boarding and Daycare, we’ve created a 3,500 square foot facility where dogs can run and play to promote healthy exercise and foster essential socialization skills for confident canines. In our expansion we added 25 brand new runs for our kennel, including three double-sized runs to accommodate our larger pets. 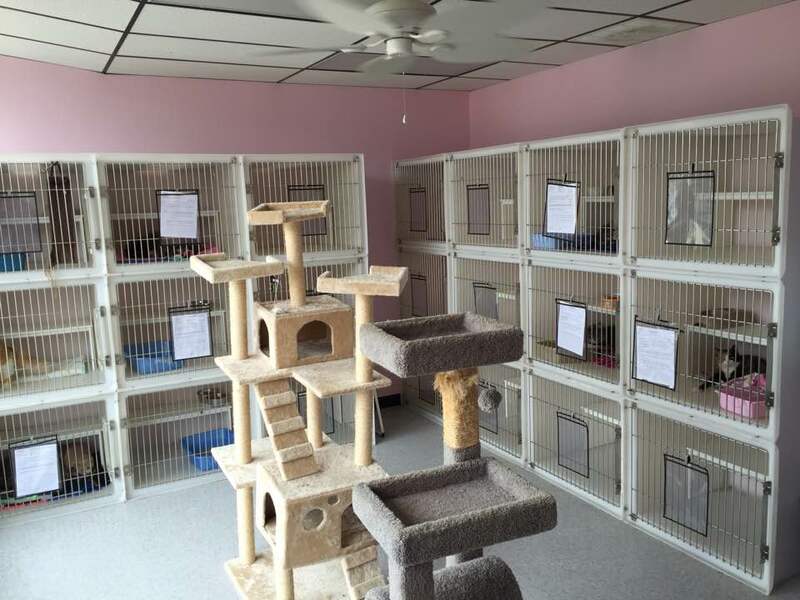 A new, large cat room with cages, condos, cage-free cat trees to climb on, and a large window to be entertained by outside life. An exotic room for our avian and small mammal guests. We still believe in walking our pets outside for fresh air and potty breaks several times daily. Dogs who board with us for three or more days get a complimentary bath the morning they are scheduled to leave. Pets boarding and in doggy daycare are fully supervised under the care of our experienced and knowledgeable staff in a fully air-conditioned space to prevent overheating during playtime. We also have a secure outside play area. Play groups last about 60 minutes and every dog participates in several play groups a day. We understand your pet is part of your family, and an extension of yourself. We treat your pets as we would our own family, which is why we are committed to the highest quality pet care available. We are passionate about what we do, and care deeply for the health and well-being of all pets. This is not a business, this is our lifestyle, and pets ARE our lives. Our pets bring us comfort, joy, and companionship through every phase of our lives, and it’s our job to give back to them as much as they give us. While at our boarding and daycare you can rest easy knowing your pets are getting plenty of love, care, and exercise while you are at work or away from home. We are proud to be a part of you and your pet’s life, and strive to contribute to the long-term wellness of your best friend. Here at Good Shepherd Veterinary Hospital we keep tails wagging and owners smiling!